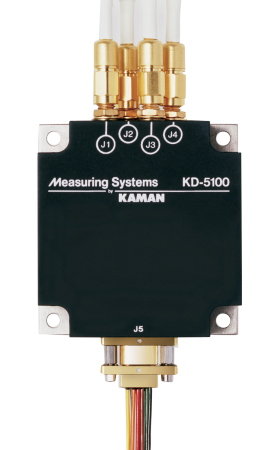 The Measuring Division of Kaman Precision Products, Inc., has announced the availability of its KD-5100 differential measurement system, which provides resolution to a nanometer of positional change. With its proven stable design, extremely small size, and low power consumption, the KD-5100 is ideal for night vision systems, precision telescope positioning, fast steering mirrors (FSM) for space-based and airborne applications, and image stabilization systems. Kaman engineers work closely with customers to understand their specific application and optimize the KD-5100 to meet custom requirements. Featuring a small package size – only 2 x 2.12 x 0.75 inches thick – the KD-5100 is a good choice for applications where space is a limiting factor. It is manufactured to MIL-H-38534, with MIL-SPEC components used throughout the electronics module wherever possible. The KD-5100 features rugged construction, with a mean time between failures of better than 238,000 hours in a space flight environment and 55,000 hours in a tactical environment. Kaman also offers the DIT-5200, a commercial version of the KD-5100 for applications where mil-spec requirements, size, weight and power consumption are not critical. The KD-5100 team of experts has a combined total of more than 100 years of application, design and engineering experience. Focused on solving customers’ measurement problems, the team is backed by an established aerospace company that has been an industry leader for more than 70 years. Kaman offers high-precision, electro-mechanical contract manufacturing at its 215,000 square foot facility, which has 150,000 square feet of manufacturing area and 220 employees. The Measuring Division of Kaman Precision Products follows rigorous aerospace quality systems. The manufacturing facility is certified to AS9100 and ISO 9001 and features a class 100 clean room. The Kaman Build-to-Print (BTP) group offers an experienced, professional team of manufacturing technologists and logistics experts that work closely with all phases of the outsourcing process. Capabilities include complete program management, laser interferometer calibration, and optics testing and optical assembly calibration, as well as laser, electron beam, and gas-tungsten welding and CNC machining. Complete inspection and testing capabilities are also available.